Sabah, which was known as North Borneo before it joined the Malaysian Federation in 1963, was part of the Sultanate of Brunei in the 16th century while the north-eastern coast of the state became part of the Sultanate of Sulu which was centered in the southern islands of the Philippines. 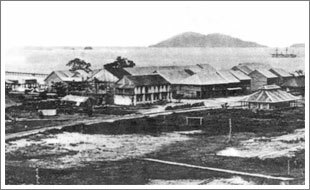 The the mid 18th century, Europeans began making an appearance and the British managed to open a trading post on Pulau Balambangan off the northern tip of Sabah. This post however failed to take off.